I think I may like this better than "The Scream." Behold! 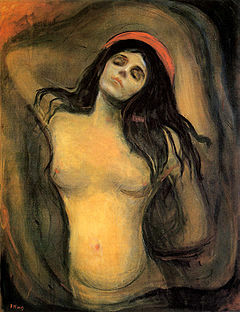 “Vampire” by Edvard Munch. “Madonna” looks equally amazing. Some day I hope to see them in person. 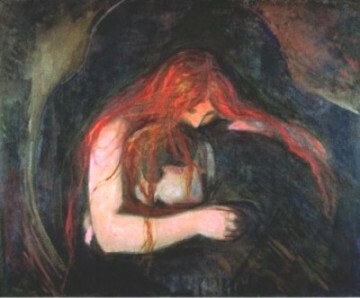 Munch chose fascinating subjects for his paintings, but I suppose growing up with a religious zealot for a father and watching his siblings deteriorate from consumption or insanity will do that to a man. Kudos to Leibs for turning me on to Munch again.